Architect Silvia Perea tells us about The Venus Project. Born in Madrid, Spain, Silvia Perea, exhibition curator at the Baker Museum, has been a student and professional traveller who has found a catalyst in art for structuring her travels and daily occupation. And it was exactly through the exploration of this exciting universe when she came across the work of Jacque Fresco, industrial designer and visionary architect founder of The Venus Project, who has had an important impact on her life. As an architecture graduate from the Polytechnic University in Madrid, Silvia has studied and worked in several architecture firms in Belo Horizonte (Brazil), Córdoba (Argentina) and Baltimore (United States). She has also been the editor of the magazine Arquitectura Viva. She holds a doctorate from Columbia University in New York, where she was a researcher and teacher for many years. We had the opportunity to talk to Silvia Perea, who talked about her professional career and her research on The Venus Project, a project that has been developed over the last eight decades, which seeks a healthier, more ecological and peaceful life in the world, Through a global holistic-systemic plan. As a child, I frequented El Prado, the royall and scientific museums, with my family and the school. But it was not until I began to study the history of art that I found an answer to the youthful need I felt to defend myself in diverse cultural contexts and to better understand the world. Of all your professional successes, which ones are you proudest of? I feel very fortunate to have been able to teach in different parts of the world and to have met wonderful teachers and students. As for my work as a curator, each exhibition is a privilege for the creative and organizational challenge it entails. I am pleased that the public has a comparable surprise and enthusiasm to what I experience while preparing an exhibition. There is no greater pride, perhaps, than that an exhibition has an effect beyond the walls of the museum. What was the path you followed to get to work in the United States as a curator for exhibitions? After working for years as editor, researcher and teacher, and having developed a doctoral thesis on the potential of art and architecture to shape new political realities; Focusing my career on exhibitions seemed like a logical step. Each exhibition project allows me to take advantage of the different facets of my training, which I find very satisfying. What does Jacque Fresco’s Venus Project mean to you? What I admire most about Jacque Fresco is the independence, determination and courage with which, over the last eight decades, against all odds, he has developed his plan for a more sustainable and fair future for all. This plan is extraordinary because it tries to respond in a global way to problems that humanity has known for centuries (poverty, famine, migratory crises) and more recently (global warming, massive deforestation, toxic waste, etc. ), and has never focused on solving. I think Fresco’s thesis (to substitute a monetary or scarcity economy, for a resource or abundance, as a means to reach a social and ecological balance in the world) opens an urgent and necessary debate about our future. How long have you been studying the work of Jacque Fresco? I became interested in his career shortly before he turned 100 (recently turned 101 years old), more than a year ago. Thanks to you Jacque Fresco; this world will be a different place to live I have faith that a change will happen really soon.. please, help us to get more and more people involved in the best idea of humans history. 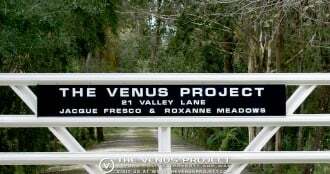 I have been interested in The Venus project for at least 15 years. Also interested in the technological changes that have taken place in recent years due to the internet. I beleive from reading much about converging technologies and concluded the world needs a RBE as soon as posible within the limits of exponatial technology. From saying that the monetary system has holted much development in good and thought out policies to move forward in challenging crisis thru out the World. Also as the large tech companies expand and those elite billionares see that there empires will in sone way help the world to get out of poverty due to there inventive and amazing technologies. We need to confront them that they must demonotise and create a better world for all humans. As the robotics take away the jobs and more and more autonation takes place the only way to go is for RBE. To free humanity of inequality.